Sometimes you do not want to install anything more than a working command-line Ubuntu Linux system. Maybe you want to use another Desktop environment than GNOME, KDE, or XFCE. I have been trying out Openbox recently, but I wanted to get a completely fresh install of Ubuntu to work with. When I first started searching the net to find how to install a minimal Ubuntu system I came to dead ends. After digging deeper into search reults and forum posts I was able to find the answer. 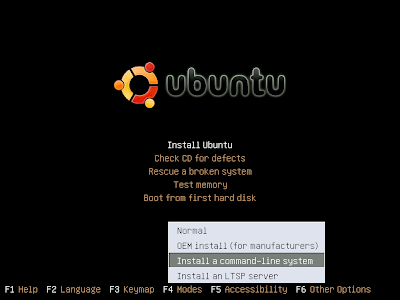 Here are the steps to get a minimal system from Ubuntu. Download the Alternate install ISO. Burn this to a disc and pop it into your computer to boot from it (unless you are doing this virtually, then you just need to make the virtual computer see the ISO). When you get to the initial boot screen do not press enter right away. Instead press F4 to bring up a menu where you can select "Install a Command-Line System". Now you press enter and follow the install process like normal. Once you reboot you will be greeted by a friendly text prompt login. From here you can customize your system however you want it.